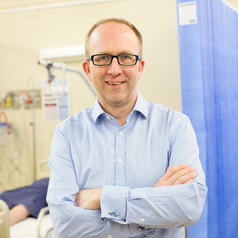 Martin Veysey has extensive international experience in both undergraduate and postgraduate medical education and as MB BS Programme Director is committed to ensuring that Hull York Medical School delivers exceptional medical education. Martin’s research interests include medical education, molecular nutrition, colorectal cancer and luminal gastrointestinal disease. He completed his undergraduate training at the UMDS, Guys and St Thomas’ Hospitals, University of London. Following his FY, Core and Specialist Training as a General Physician and Gastroenterologist, he migrated to Australia in 2003. He joined Hull York Medical School in 2017 as MB BS Programme Director. He is an Honorary Consultant Gastroenterologist at York Teaching Hospital NHS foundation Trust and Associate Non-Executive Director at Hull and East Yorkshire NHS Trust.